Your wireless router is set to a Dynamic Frequency Selection (DFS) channel. Then, you decide to extend the network using a Linksys range extender. 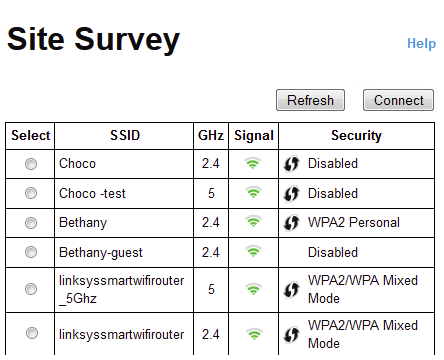 However, you can’t see the 5 GHz network name (SSID) from the list of available networks on the extender’s Site Survey list. QUICK TIP: The Site Survey feature of your Linksys range extender displays all the wireless networks within the range of coverage. Check if your router is DFS certified. NOTE: Not all dual-band routers support DFS. Examples of dual-band routers that support DFS are Verizon FIOS G1100, Linksys EA9500 (EMEA models), Apple AirPort Extreme®, WNDR3700v4, WNDR4300 and others. If the router is DFS certified, log in to your router’s page. To learn how you can access the Linksys Smart Wi-Fi Router’s page, click here. 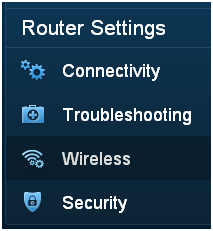 Under the Router Settings section, click Wireless. Look for the 5 GHz network section then check if the Wireless Channel is set to Auto or to a DFS channel. NOTE: DFS channels include ranges of 52-64 and 100-140. If the router is set to Auto or a DFS channel, change it to channels 36-48 or 149-165. NOTE: Some countries do not support Wi-Fi channels 149-165. Click or to save the settings. After changing the router's channel to non-DFS, return to your Linksys range extender’s Site Survey page again or refresh the network list and you should now be able to see your 5 GHz router network name in the list of available networks you can extend.